The Green Bay Packers have won three straight and it’s no surprise that QB Aaron Rodgers has been a roll in those last three contests. He has 10 TD passes and no interceptions in those three games, and he has thrown 14 TD passes with no interceptions in his last five games. 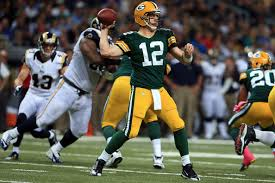 During the Packers three-game winning streak, Rodgers has no interceptions and at least three TD passes in each of those games. Since 2008, when Rodgers took over as the starting QB of the Pack, Rodgers has had 29 games with 3+ TD passes and no interceptions, most of any QB in the last six-plus years. With 29 games he also ranks fifth since 1966 in those games. First, let’s look at the QBs that have had the most 3-TD (or more) passes with no interceptions games since 2008. Now let’s look at the list since 1966. To add another element, also noted is the record of the QB’s team in those games when they throw three or more TD passes in a contest with no interceptions. Of the six games played by Rodgers this year, four of them have been games where he had 3 or more TD passes and no interceptions, tops in the league. Peyton Manning and Philip Rivers have three such games, while Joe Flacco, Matt Ryan and Alex Smith have two. There are eight other QBs with one game apiece.